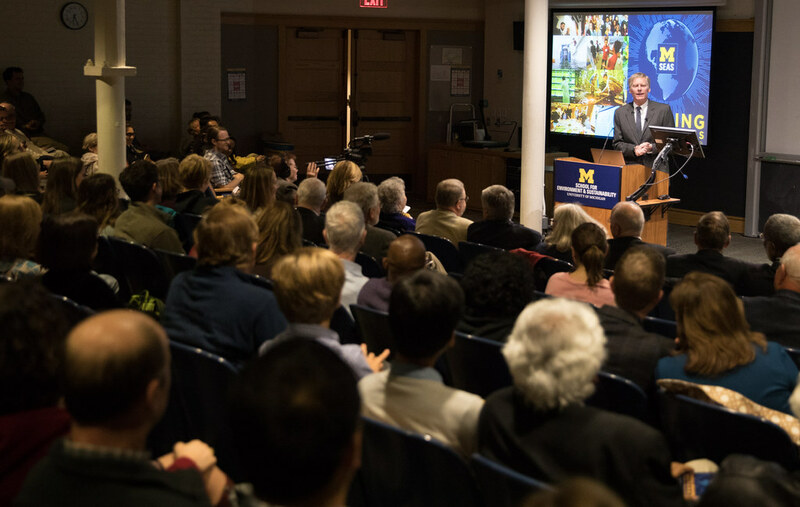 The launch of the new School for Environment and Sustainability got off to a great start with the Samuel A. Graham Dean’s Lecture and Installation of Dr. Jonathan T. Overpeck on Oct. 26, followed the next morning with opening ceremonies at the Dana building. The dean, along with President Mark Schlissel, SEAS graduate student Natalie Payer, and Board of Regents Chair Mike Behm officiated the ribbon-cutting at the event, and members of the U-M Marching Band performed “Hail to the Victors” in celebration of the new school. Later that morning, seven young climate leaders discussed innovative solutions at the Climate Change Summit held at Rackham Auditorium, and responded to questions from student organizations. Hover over the image below to click through our photo gallery of the best moments from the Opening Ceremonies.